You are going to Watch Naruto Shippuden Episode 360 English subbed online free episodes with HQ / high quality. Stream Anime Naruto Shippuden Episode 360 Online English sub Jonin Leader. After being relieved from his Anbu duties, Hiruzen still seeing him having “darkness” on his heart, Kakashi is reassigned to be an instructor to genin shinobi. 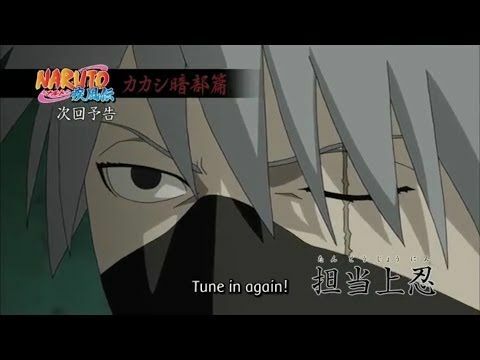 Having recalled his past mistakes on his training days under Minato, Kakashi decides to employ his own method in instructing his candidates with the bell test while testing his would-be students’ teamwork and ability to think for themselves rather than mindlessly follow the rules. Meanwhile, after Team Guy is established, Guy is worried when he hears Lee, Neji, and Tenten talk about Kakashi having recently failing a trio of brothers. At the dumpling house, with Hiruzen suddenly joining them, Guy talks to Asuma and Kurenai about Kakashi’s methods before attempting to talk to his friend. Refusing to talk to Guy about his methods, Kakashi later encounters the three brothers as they thanked him for teaching them a valuable lesson. Sometime after, Kakashi meets with Hiruzen after the Third Hokage handpicked the next set of students he is to test: Sakura, Sasuke, and Naruto.